Your ring should go onto your finger more easily than it comes off. When washing your hands, your ring shouldn’t slip around. Your ring should not leave a mark or cut off circulation in any way. You should have the same ring size for a comfort fit band as a standard (non-comfort fit) band. The comfort fit band will enable you to get the ring onto your finger more easily, but the ring size itself should not be different. A finger on the dominant hand will be about ½ size larger than the same finger on the non-dominant hand. Square bands are more difficult to resize later than round bands. If you are considering a wider band, you likely will want to go up ¼ to ½ size. When more metal covers the surface area of the finger, extra “breathing” room allows your finger to move around more easily. If possible, it would be best to try on bands in the same width you are considering – or to have someone help you with wider sizing rings. We recommend going to *at least* two jewelers to get help with sizing prior to ordering online. Ring sizing is a bit of an art, and unfortunately not all practitioners of this art are equally adept. Plastic ring sizers or DIY tricks found on the Internet might help you to get into the ballpark of your size, but there’s no substitution for the guidance of a person who understands the nature of fingers. When Dan checks the size of a ring, he measures where the *edge* of the ring falls on the mandrel. The ring in the picture, therefore, is a size 9 ¾ . 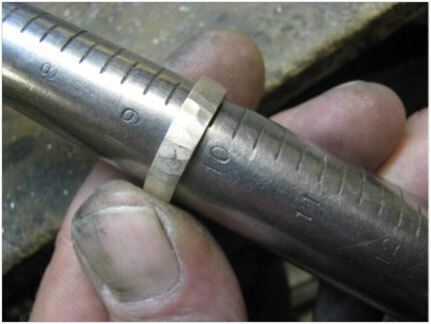 If a jeweler were to size a band with the “9 ¾” mark at the center of the ring or on the top edge, the size determination obviously would be different. Most jewelers will size rings as Dan sizes them and as shown in the photo – but it isn’t a given. It is important to note that when Dan sizes a ring on the mandrel, he pushes down on the ring. He does not do this in a forceful manner; but he doesn’t simply let the ring fall onto the mandrel, either. If it turns out that your ring needs to be increased or decreased in size just a bit, we will be happy to help you to resize the ring. We offer this as a free service for the first three months post-purchase, but we ask that our customers cover shipping and insurance costs from both ends. It shouldn’t take us longer than a day or two to turn the ring back around to you. If the ring is a size or more off, however, there’s a good chance that Dan will need to make a new ring for you. We have had several customers who were given wildly incorrect sizes by their local jewelers, which is why we recommend going to at least two jewelers for assistance. 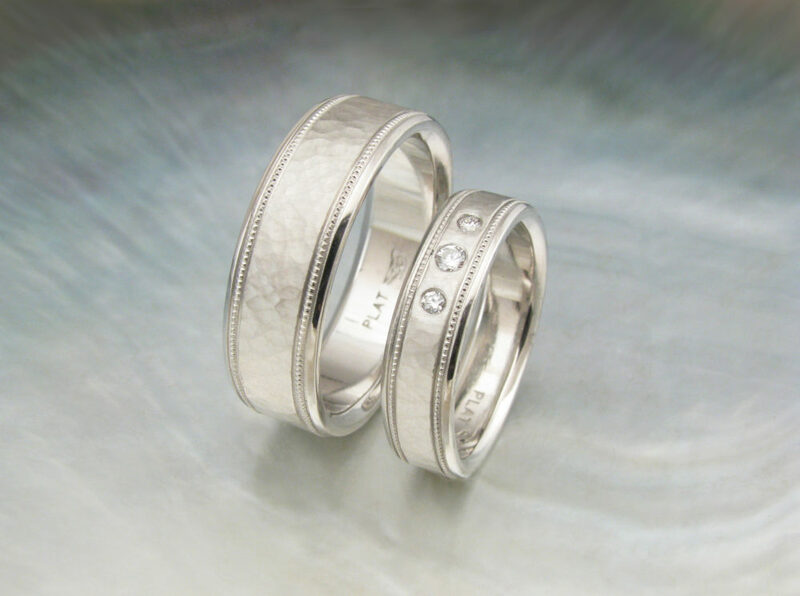 If you are not accustomed to wearing rings, you likely will believe that your ring is too tight once you put it on. We have a lot – A LOT – of men, especially, who are convinced that they need to increase the size of their rings; but once they wear the rings for a little while, they get used to the feeling and find the rings comfortable. It’s best to give it a little time before running to resize… you wouldn’t want to increase the size only to lose the ring when it falls off your finger.